OTT revenues in Sub-Saharan Africa have been tipped to exceed US$1bn by 2024, compared with US$223m last year. That’s according to the Forecasts Report for Sub-Saharan Africa OTT TV and Video, which added that even with the predicted increase, there is still room for growth in Africa in the long run. Only 15 countries out of the 35 covered will bring in more than $10m of OTT revenues by 2024, the report said. 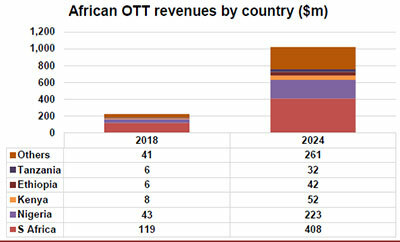 Countries with the highest OTT revenue will be South Africa (40%) and Nigeria (22%). By 2024, SVoD, which is the main revenue driver for OTT TV and video, is expected to generate US$782m in the region. The report also anticipates SVoD subscriptions will increase from 3.03 million in 2018 to 10.21 million by 2024. It expects South Africa to have the highest number of subscriptions, with 3.46 million, while Nigeria is tipped for second place, with 2.56 million. South Africa and Nigeria together are predicted to account for 59% of all SVoD customers in Sub-Saharan Africa by 2024, down from their 71% market share last year.